As we continue to spring forward to warmer weather, there are lots of opportunities this weekend to hit the trails and get back to nature, as well as follow the path to lots of shopping and cultural destinations. And, Weekend Primer is equipped with its trusty compass to lead you in the right direction to find some fun. On the Second Saturday of the month, additional locations and activities open up on the Rural Routes to Main Street Cultural Trail. The self-guided, self-directed driving tour features more than 30 places to visit including art galleries, artisan studios and handcrafted gift shops as well as restaurants, wineries and more. Whether you&apos;re looking for a girlfriend getaway or some places to visit with a group of friends, the Cultural Trail is a great way to see some of the more unique and one-of-a kind shops that Hendricks County and our neighbors in Morgan County have to offer and every Second Saturday is the best time to go. If the trail you seek is to experience more of the great outdoors, you&apos;ll want to head over to either Sodalis Nature Park or McCloud Nature Park on Saturday and enjoy a trail walk with the park&apos;s naturalists and a noted author on wildflowers, Norma Wallman, to see and learn more about what&apos;s in bloom. In fact, you can visit both parks as Sodalis, 7700 S. County Road 975 East in Plainfield, will host its wildflower hike from 11 a.m. until 12:30 p.m. Then, from 2-4 p.m. that same afternoon, McCloud, 8518 Hughes Road in North Salem, will have its own version. Bring along a picnic and you can make a day of it. 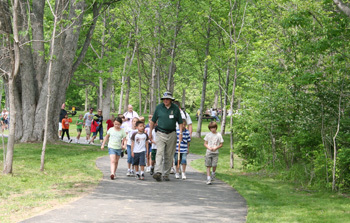 The nature walks are free and children and adults of all ages are welcome. Another outdoor option this weekend is at a place that, trust me, you&apos;ll love - Natural Valley Ranch, 6310 E. County Road 350 North in Brownsburg. The annual Bountiful Babies at the Ranch event will be from 2-4 p.m. Sunday and is designed specifically for children ages 2-8. The event offers activities such as making a goat snack and feeding the goats, a photo booth with the baby animals, crafts, a petting zoo and face painting. Throughout the event, kids will get to interact with a variety of baby animals. In the event of inclement weather, the event will be held inside the barn. Up to 6 people can participate in "Bountiful Babies" for just $35. More than 6 in your family or group? No problem, it&apos;s $5 for each additional person. And, guests are encouraged to also bring along non-perishable food items when you visit and the items will be donated to a local food pantry.